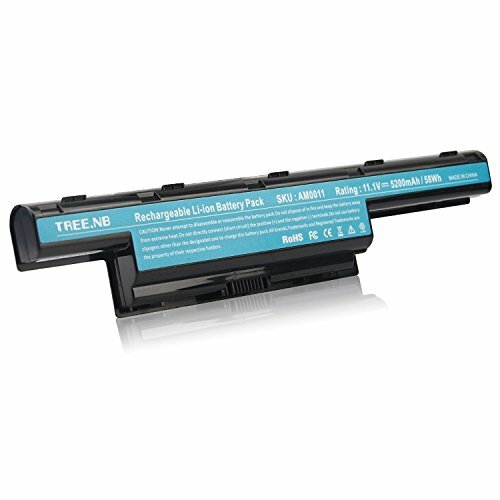 General 5200mAh replacement batteries only last 2~3 hours, to ensure our customers have 4~5 hours operation time, Tree.NB laptop batteries include only the highest quality battery cells and components. We are passionate about excellence so that with every Tree.NB brand purchase, you can expect to find quality materials, high performance, affordable prices! Battery Operation Time: Around 4~5 hours. The actual operation time will depend on how much electricity is required by the device and how you use it. Rechargeable up to 800 times over life of batteries. Certified by CE, FCC, RoHS, 24 months hassle-free warranty service.We provide best prices possible on the highest quality products and the most popular brands. Compatible Models 2:Acer TravelMate 4740 4750 5335 5542 5542G 5735 5735Z 5740 5740G 5740Z 5742 5742G 5742Z 5742ZG 5744 5760 6495T 7740 7740G 7750 7750G 7750Z 8472 8473 8573 TM5742;Gateway NV57H NV55S NV50A NE56R NV51B NV75S NV77H NE51B NV76R NV52L NV73A NV79C NV56R NV49C. If you have any questions about this product by Tree.NB, contact us by completing and submitting the form below. If you are looking for a specif part number, please include it with your message.